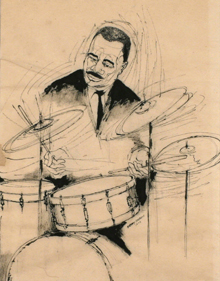 "Drummer Man" by Benny Andrews. Emory University will host an exhibition of 20 original drawings by the late Benny Andrews, on loan from the Andrews Humphrey Family Foundation. "Like a Purple Haze Across the Land: The Art of Benny Andrews" runs March 28 through Nov. 2, 2012, in the Corridor Gallery on Level 3 of Emory's Robert W. Woodruff Library. "We're very excited to be able to show these original works by Benny Andrews at Emory, the first time they have been exhibited as a group," says Randall K. Burkett, curator of African American collections at the Manuscript, Archives, and Rare Book Library (MARBL) at Emory. "Andrews always had a devoted following of art collectors and art lovers in Atlanta, and we're extremely honored that Nene Humphrey, his wife of 20 years, chose Emory for this exhibition." A symposium on Andrews's life and work will be held Wednesday, April 18, at 7 p.m. in the Jones Room, Level 3 of the Woodruff Library. Associate curator of African American Collections and curator of the exhibit Pellom McDaniels III will discuss Andrews' art, followed by a presentation by Humphrey, also an artist. Her talk is titled "Artist to Artist: Reflections on a Life Together." The program will begin and end with refreshments and an opportunity to view the exhibition. The symposium is co-sponsored by the Department of African American Studies, the Department of Art History, and the Graduate Institute of the Liberal Arts. The exhibition consists of line drawings, many of which Andrews created while he attended the School of the Art Institute of Chicago. "He traveled the streets of Chicago and recorded what he saw, the nightlife, the culture," McDaniels says. They include images of a man playing a piano, a preacher at a pulpit, a traveling man with his case and guitar, and a man playing the drums. McDaniels thinks viewers will find the range and the content of Andrews' work appealing. "He's very much a humanist. He sees the commonalities and struggles across race, across region, geography," McDaniels says. "I think that was one of the unique things about him as an artist. For him, it was to go beyond what you're trying to say with your art and actually act on these notions the art represents." MARBL is the proud holder of the Benny Andrews papers, consisting of more than 160 boxes of manuscripts as well as sketch books, exhibition catalogs and other materials that document the life and work of this beloved Georgia-born artist.